At 11am on November 11, 1918, the big guns of the Great War fell silent, thus marking the end of the war to end all wars. Originally called Armistice Day, a public holiday in several European countries, Remembrance Day is a time to remember and give thanks to the countless servicemen and women who fought for our freedom; those who gave their lives serving their countries, sacrificing their todays for our tomorrows. In the UK, the date of November 11 is not always the day of remembrance, instead the second Sunday in November is utilised as Remembrance Day. The Royal British Legion runs its national fund-raising poppy appeal, gathering much-needed funds to provide welfare support for former servicemen and women. The symbolism of a poppy is taken from the iconic and moving poem by Canadian John McCrae. The poem’s opening lines make reference to thousands of poppies being the first flowers to grow on the battle-scarred fields of war. The title of McCrae’s poem is In Flanders Fields. This is what brings in former serviceman Kevin Williams from Grimsby. 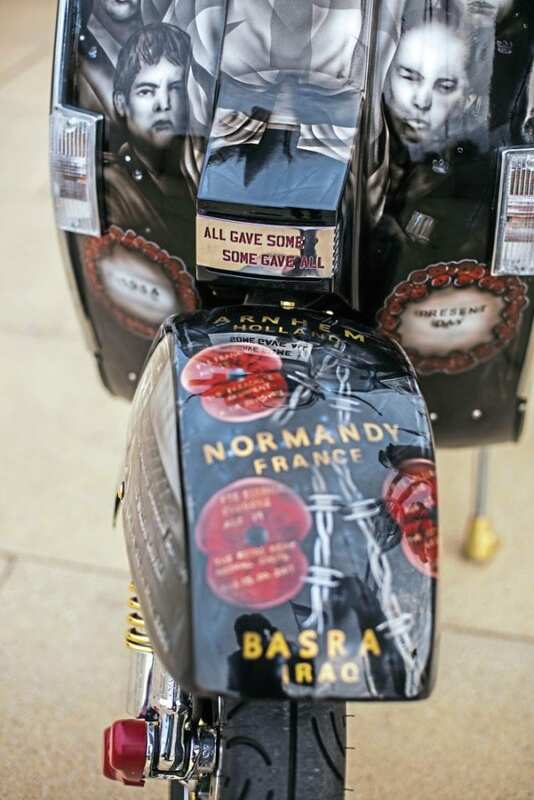 He built a custom Vespa which was featured in Scootering in November 2014, marking the centenary of the outbreak of the First World War and themed loosely on John McCrae’s poem. 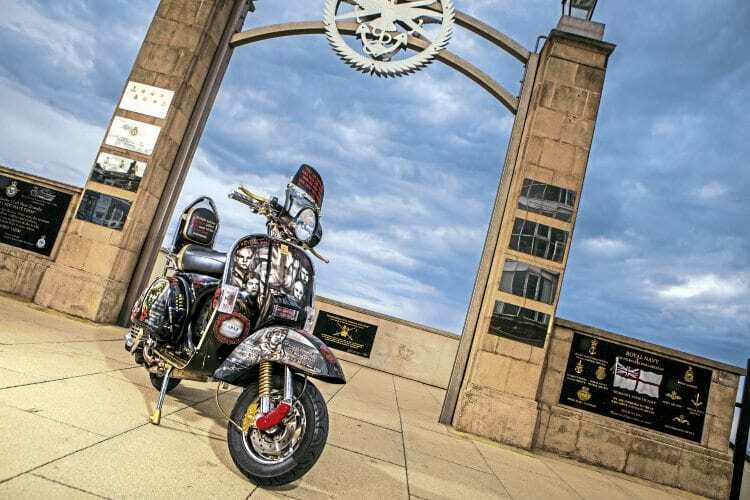 Three years on and we have Kev’s sister scooter to Flanders Fields, a full blown custom Vespa by the name of Remember Them, complete and already picking up awards. Key says: “Even before Flanders Fields was finished the plans and ideas for Remember Them were slowly coming together. 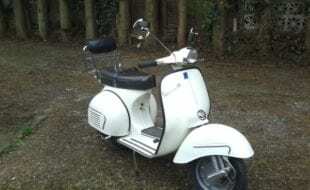 I bought the base scooter, a PX200 disc model in 2014, work more or less started straight away. I learnt a lot during the two years Flanders Fields took to build, specifically, I learnt to be patient. Easier said than done, as I’d describe myself as an impatient person at times. 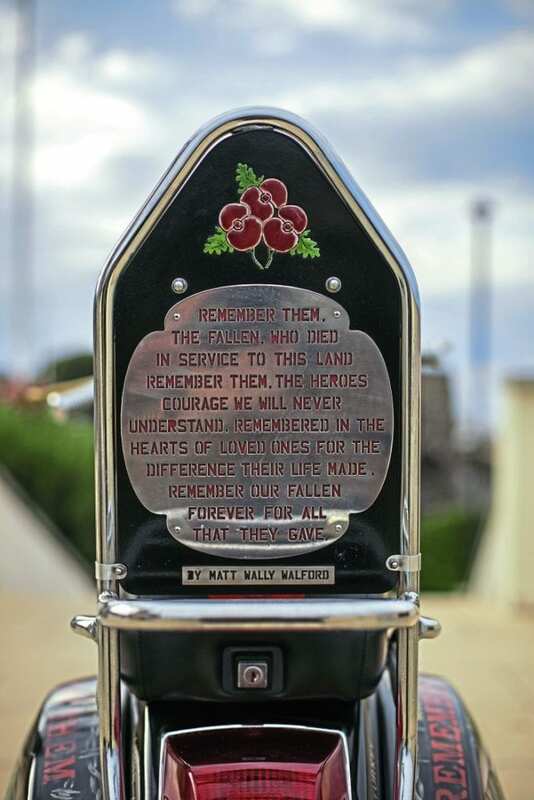 Even without checking the details given on Kev’s specifications regarding Remember Them, the artwork has the unmistakable style created by the talented Gatch. As well as likenesses of some of those who fell during conflicts over the years, there are also different kinds of barbed wire replicated within the paintwork. How did Kev decide on who would represent particular conflicts? “It did take quite a lot of research into whether or not the pictures were subject to any form of copyright. Once it had been ascertained there was no copyright likely to be infringed upon, Gatch went ahead. There are two on Remember Them that I have something of a personal connection with: the Falklands soldier was a friend of a friend. I spoke to his son and told him what I was doing with Remember Them, and he was happy to give his permission. Then there are the different types of barbed wire worked into the artwork, what’s the significance of that? Similar to Flanders Fields, with Remember Them Kev has opted to more or less leave the engine internals as Piaggio intended. 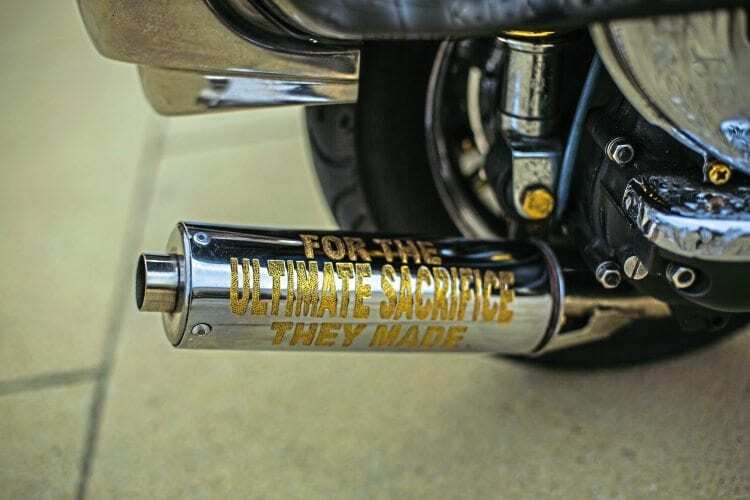 Just the one deviation from stock is a Sterling exhaust system, which does lend itself much better than a standard system to plating and engraving! 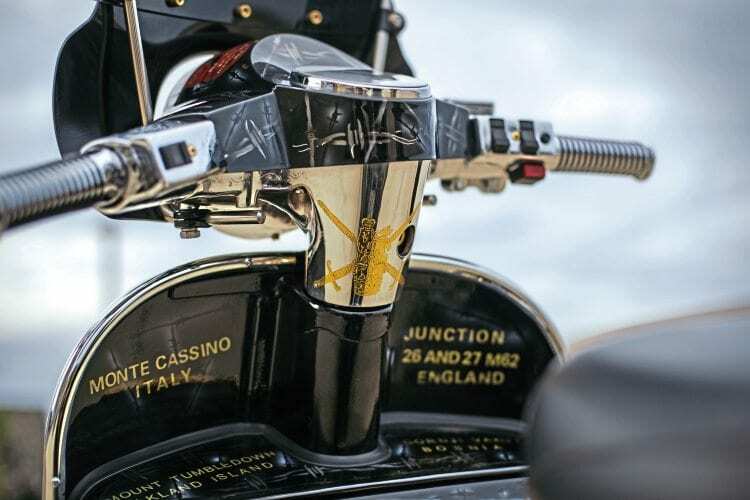 On the subject of the engraving, it was all created by the meticulous, steady hand of Hull-based Kevin Adams. 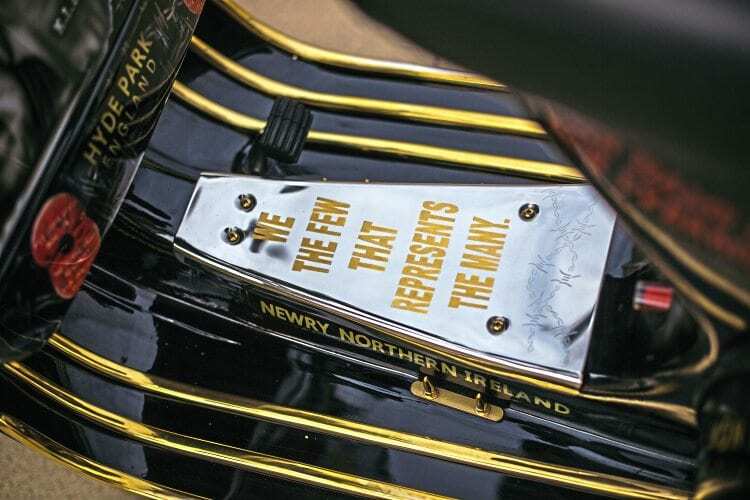 One particular piece of detail which Kev is particularly pleased with is the Help For Heroes logo on the outside edge of the kickstart pedal. Believe me, there’s so much more to admire in the engraving work. 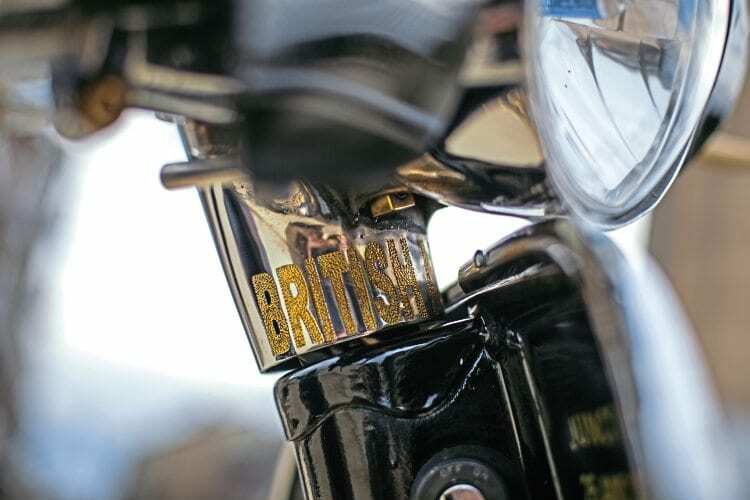 Another detail that doesn’t instantly jump out is the two ‘bullet holes’ holding the number plate in position. 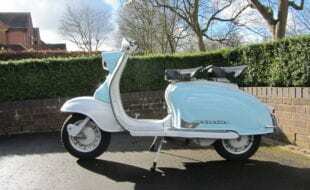 Bespoke seat, backrest and rack were hand made by Corky at Lambretta and Vespa Coverings. Across the seat is part of the famous words from the poem For The Fallen by Laurence Binyon. The poem was composed to honour the casualties of the British Expeditionary Force at the Battle of Mons and the Marne in the run into the opening of the Western Front during the Great War. For The Fallen comprises four stanzas, the fourth being the section commonly known as Ode To Remembrance. 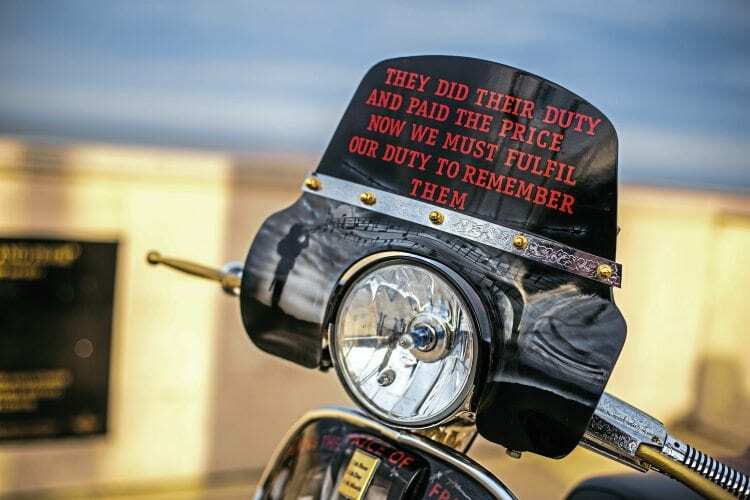 The simple words on the back rest pad are frequently used on news bulletins following the passing of a serviceman during a conflict. 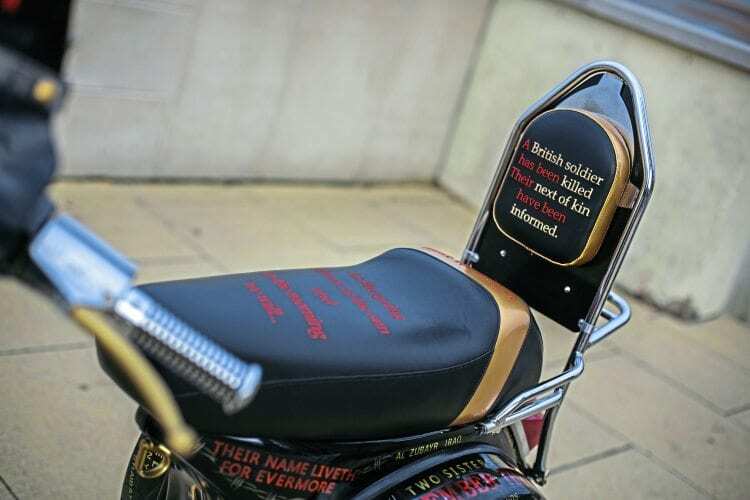 The rear of the backrest has an original poem by Matt Wally Walford. 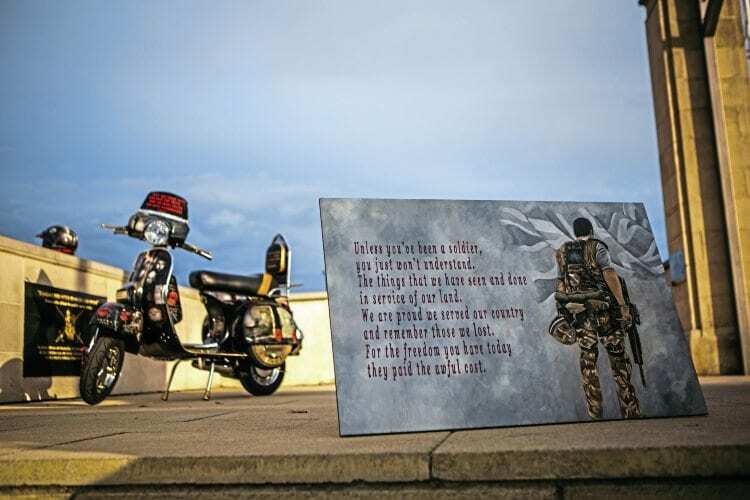 “Wally is a friend of mine, he’s always writing poems, I asked him to do one for my scooter and it’s the first time he’s ever had a poem published,” says Kev. Poignant, evocative and humbling, Remember Them is certainly not a glorification of war. It’s a moving and heartfelt tribute from an ex-services veteran to fallen colleagues, brothers (and sisters), in arms, who gave their all so we can live our lives in freedom. Wear your poppy with pride and most of all, as a nation, we should always remember them. Scooter club & town: Lincolnshire Crusaders, Grimsby. 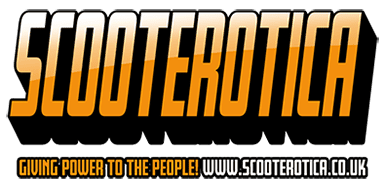 How and when did you first become interested in scooters: I was home on leave from the army and my mate had a scooter. 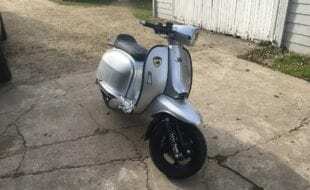 What was your first scooter: SS180. First rally or event: Hastings 1980. How did you get there: Scooter. Favourite and worst rally/event: Cleethorpes, Skegness, Yarmouth. Worst Morecombe. 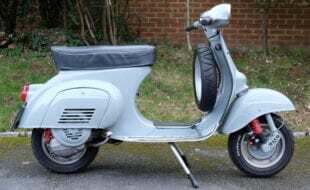 Funniest experience with a scooter: Travelling to a rally in Clacton on the back of my mate’s Lambretta, he stopped at traffic lights. I stood up to stretch my legs and he rode off without me. 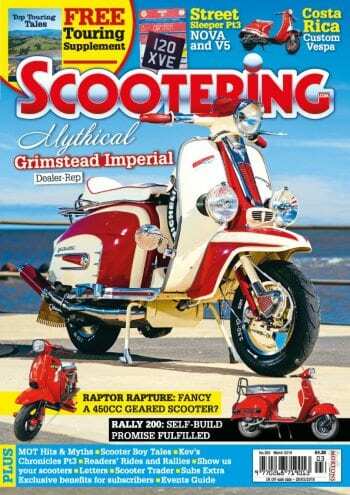 What’s the furthest you’ve ever ridden on a scooter: Tilbury to Dunbar in 1984. 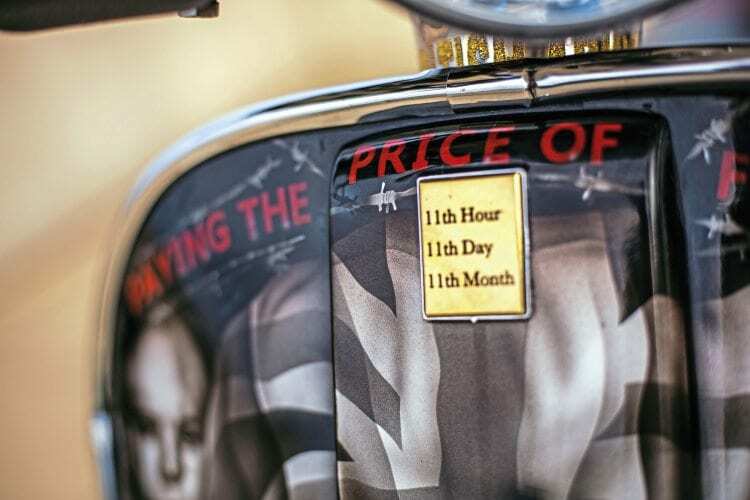 Your favourite custom/featured scooter of all time: Way of Life and My Faithful Friend. 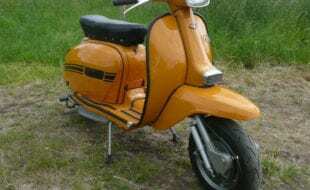 What’s the most useless part you’ve ever bought for one of your scooters: Furry tiger seat cover. 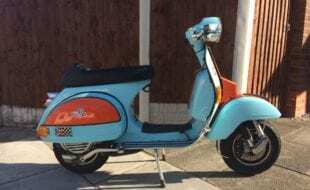 Scooter model: Vespa PX200 disc. Date purchased & cost: 2014 £700. Time to build: Three years. Paintwork & murals: Gatch Airbrushing. Engraving by: Kevin Adams of Hull. 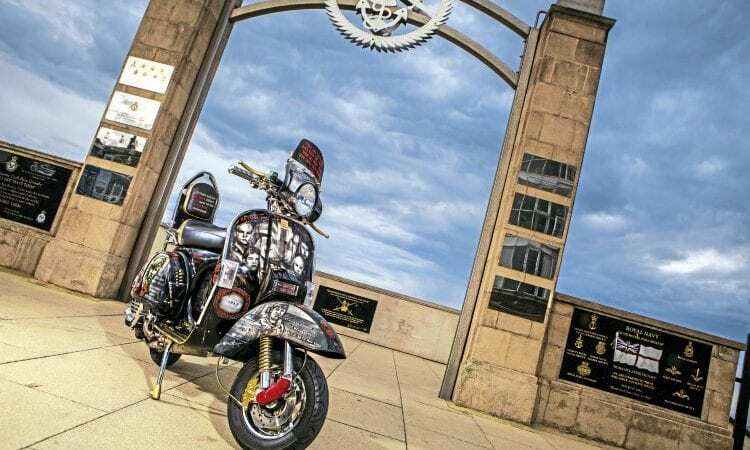 Lloyd Walker, Kevin Adams, Gatch Airbrushing, Corky Lambretta and Vespa coverings, Keith Newman K2 customs, Kenneth Betts, Phil Grant, Pete Coddington. Most of all to my wife Dawn for her understanding.